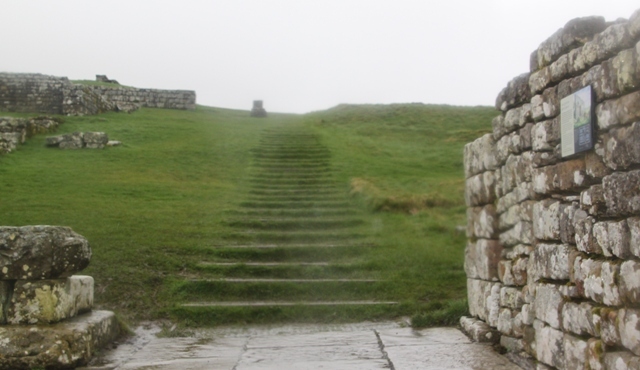 Hadrian’s Wall – top of my must-see list for this Northumberland jaunt. A UNESCO World Heritage site, it marked the very edge of the greatest empire Europe has ever seen. (My) excitement levels were high, Husband and Son were more obsessed with the torrential rain. I must admit the closer we got to the wall, the worse the weather became. Still nothing else for it but to get “waterproofed” up and make the most of the great outdoors. Hadrian’s Wall extends from Newcastle upon Tyne on the eastern coast of England to Carlisle on the western coast. 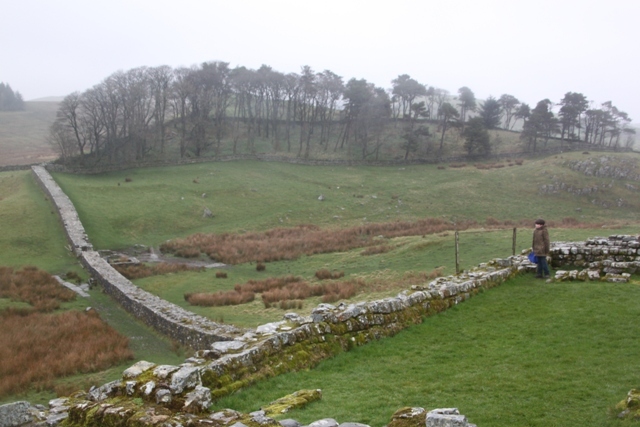 When the Roman Emperor Hadrian visited the far flung province of Britannia in 122 AD, he decreed a wall be erected on the northernmost border of his empire to “separate the Romans from the barbarians.” Elite Roman troops spent 6 years building this mighty wall – 73 miles long, 10 feet thick and 15 feet high. It is the most prominent evidence of Britain’s 400 year occupation by the Romans and is simply awesome. We parked up at Housesteads, apparently the best bit of the wall is between Housesteads and Vindolanda so we went with that and based ourselves here for our wall hike and exploration. 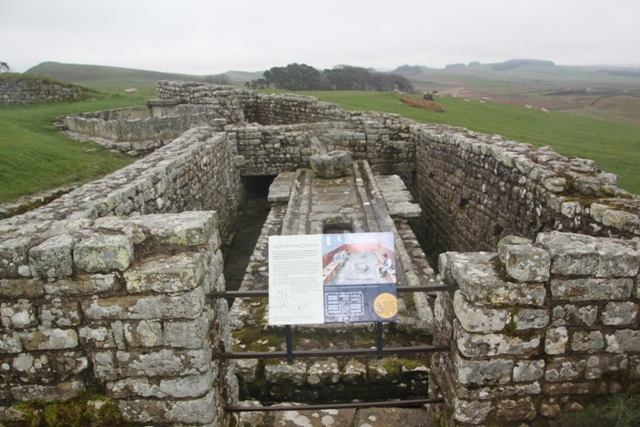 Housesteads is pretty interesting anyway – it has a partially excavated Roman fort – Vercovicium – one of several built along the wall to help maintain its defences. We set off to walk the half a mile uphill stretch to the fort. The terrain is rough – sturdy boots are essential. Son somehow smuggled an umbrella out of the car which impeded his walking progress, drove me mad but kept him entertained. The little museum near the fort has an exhibition on what life was like here – the very edge of the Roman Empire. They had various artefacts on display and a child-friendly version of everything narrated by Felix the infantry soldier. They also had a great film about life on this hilltop fortress – not too long, but fascinating. That all set the scene for us, so afterwards walking around the ruins, we could imagine how it used to be. We wandered, climbed, slipped in a lot of mud but saw the barracks, the commandant’s house and the oldest toilets ever. Needless to say these were Son’s favourite – the communal aspect in particular he found especially intriguing – little boys can be particularly gross at times. It was pretty amazing to stand at the gate of the fort and reflect that for the Romans, this was the edge of the known world. Our first sight of the wall was pretty amazing too. It stretches as far as you can see in both directions, dipping and diving along the contours of the land. Excavations, repairing and generally maintaining the wall is a Northumbrian growth industry. The rain poured down all day long, but somehow this made the scenery and wall even more dramatic. The windswept heights, vast swathes of moorland and ancient ruins looked even better with black thunderclouds rolling in. The wall is fascinating – not just because of its sheer length, but the fact it is still here, nearly 2 millenia after it was built. What a special place – ancient Roman ruins and a dramatic vista – it definitely lived up to my expectations. The weather …… well that was another matter. This was the first time we’d explored this area too (we don’t live so far away!!) but we loved it. The wall is fascinating, lots of interesting places to stop and visit, unfortunately we didn’t have time to do much more than scratch the surface! It is definitely worth a stop if you are in this area. Wonderful photos and descriptions. I’m curious, what are the stones in the middle of the rectangle structure (4th from bottom)? Thank you – it’s a wonderful place! 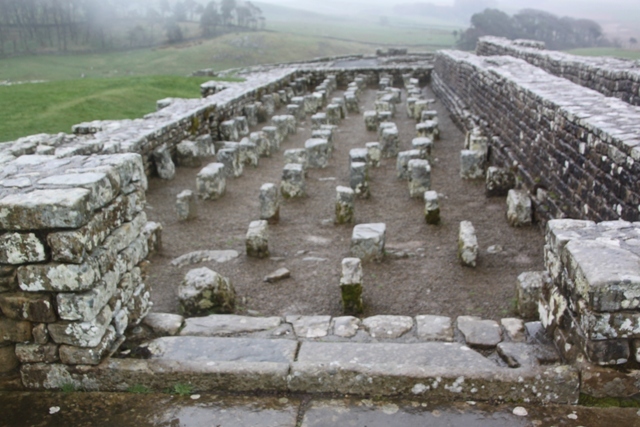 The Romans apparently had raised floors for underfloor heating/keeping warm and these were the floor supports. I find it fascinating how advanced things were then! That never even crossed my mind. That is very advanced and probably needed! Thx for the history lesson. Thank you for this blast from the past! My husband and I lived in Newcastle for a year while we completed our MAs. We really miss Geordie life. That must have been a fun city to study in – lively and loads to do, plus beautiful countryside so close by! Thanks for dropping by. I’ve always wanted to see this! Thanks for sharing on a bad weather day to boot! The weather was just as bad as it could be that day – rain like you would not believe. But we loved exploring and it is such a great place. 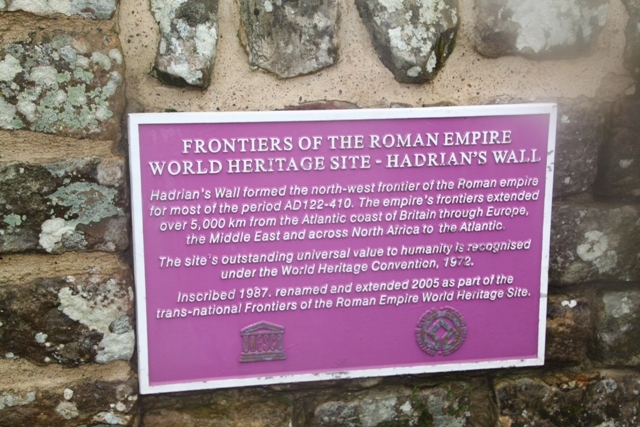 My husband is fanatical and amazingly nerdy about ancient Rome so we have been to Hadrian’s Wall several times. It is one of the things we are probably going to miss most about Britain. In fact, living outside Europe will probably lead my husband to pine for all bits of Roman rubble everywhere. I totally get that you know!! Ancient Rome does tend to bring out my inner nerd as well. Absolutely LOVE. I have always wanted to see this. It is fascinating history. I wish I had a chance to see it when I was in England. Thank you for sharing. Oh you definitely should go and see it if you get the chance in the future. 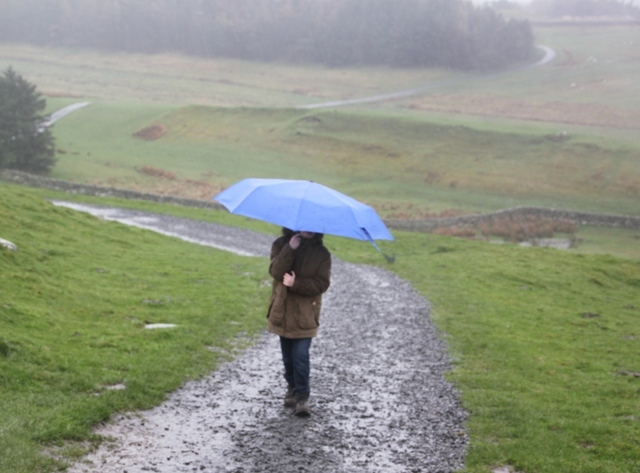 Be prepared for adverse weather – but it is wonderful. How beautiful and I love the history behind it! Now I wish I too could visit! It’s fascinating – we loved it here and want to go back! Yes Joanie, that sounds like the same hike to me – hope you had better weather than us!! Thank you for reading, enjoying your blog very much too. 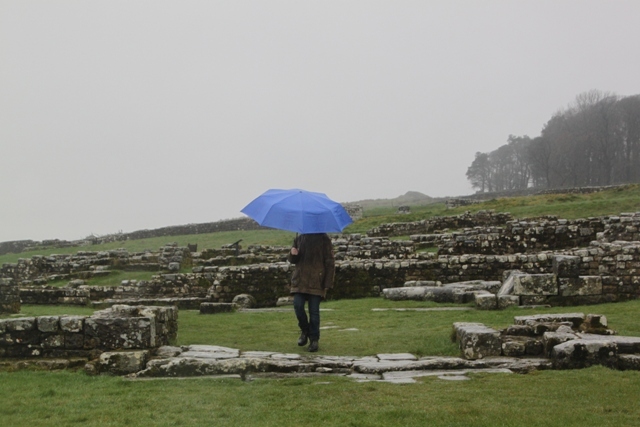 I did have slightly weather… but I visited in 2007, which may still be one of the rainiest summers in English history! The weather doesn’t seem to have ruined your photos – or your day out! We went looking for a different section of the wall once and got sort of lost. It’s one of our “ones that got away” and really, somewhere with a more obvious starting point (like a museum) would have been so much better. We are troopers in this country (no option really!) at grinning and bearing rain. This was a bit of an endurance test that day though it must be said. Funny, a friend of mine was telling me about a similar experience with the wall – they drove for ages and couldn’t find it then gave up! Definitely easier if you head to a museum first. What an interesting place! Good on you for not letting the weather stop you! Thanks for stopping by and liking my post. I look forward to exploring your sire more! Thanks Sheila, it really is fascinating. Weather a bit different to what you had in your posts!! It is fascinating, definitely worth a visit Meg! Oh my gosh! I *must* take my kids here. Unfortunatly my holidays are December/January every year (I’m in Australia). Do you think it would still be a good time to visit? The weather might be pretty cold at that time of year Leah, winter in Northumberland can be harsh to say the least. That said, in the UK you just never know. It could be fine at Christmas and have lots of snow at Easter! I know! It makes me think Spain would be a better place to travel to! (We’ve done Italy in January which was wonderful). If we visited in June/July we would have a mere 2 weeks. Oh the quandary! Lovely blog post. 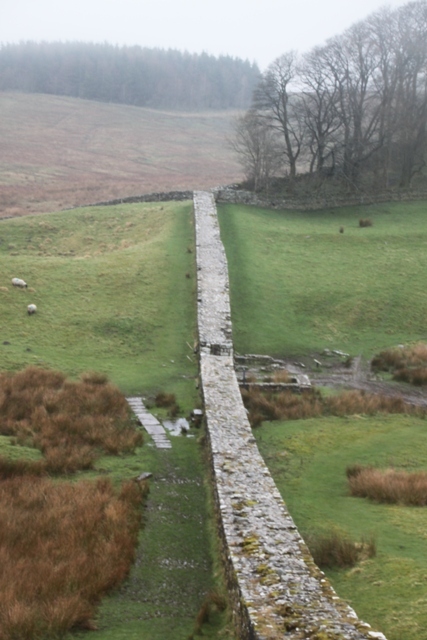 I’ve always wanted to visit Hadriens Wall since I did a project about it at school. Well done for battling the rain! 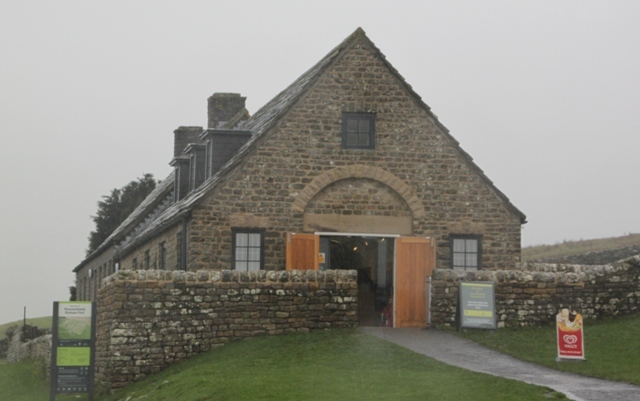 It is definitely worth a visit – fascinating and beautiful – just be prepared for all weathers! I know exactly what you mean – although sometimes I wish we would have some blue skies just a (little) bit more often…. Thanks heaps. I have visited Roman ruins from Egpyt, to Israel, to Turkey (some of my favorites there), to Italy (fancy that! ), to France, and never get tired of stumbling on their talents to build lasting things. This soggy tale still got the fire burning in my brain for a trip to England one day, beyond a mad dash in the London area. Need to put this on the list. Thanks for sharing with us. Great you could do this as a family, with a curious boy (boys like empires, I think–well this boy did back in the day). Thanks for reading Rudy – you should definitely venture up north when you get back to England. Rain and all this place is amazing.